Looking to rent a holiday home in the UK this summer? Head to Llandudno in Wales for the best family rentals, says a new Tripadvisor study. The holiday review site, which is home to more than 65,000 holiday rentals in the UK, has revealed the UK towns and cities which family travellers rate highest for holiday rentals. In a study of reviews posted on holiday rentals by family travellers over the last year, Llandudno ranks top among UK towns and cities with a near perfect average review score of 4.97. St. Davids, also in Wales, takes second place with 4.96, while Scotland's Stirling comes in third with 4.95. Wales came out on top for highest scoring towns and cities, being home to four towns and cities in the UK's top ten best rated for families – Llandudno, St. Davids, Hay-on-Wye and Barmouth – more than England (three), Scotland (two) and Northern Ireland (one). While individual towns and cities in Wales score highly, when looking at a country level, it is Northern Ireland that tops the ranking – with an average score of 4.92 for holiday rentals there. Scotland and Wales follow with average scores of 4.89 and 4.87 respectively, while England trails behind albeit with a still very creditable average score of 4.85. Tripadvisor spokesperson, James Kay, told Aol Travel: "It's clear that travellers, particularly families, love holiday rentals. "The space and amenities that they offer, such as pools, extra bedrooms, fully-equipped kitchens and backyards, often make them a great value holiday option for families." So what will you find if you head off to Llandudno this summer? 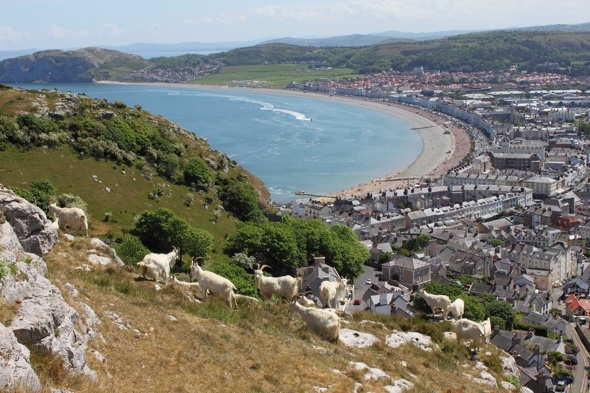 According to Visit Llandudno, as well as great holiday rentals, you'll find: "Amazing Blue Flag beaches (including the excellent Colwyn Bay beach and Llandudno beach), the great orme, the Llandudno pier, the Llandudno cable cars, excellent theatres, a fascinating conservation zoo, top-draw golf courses, mighty big mountains and green valleys, some amazing restaurants, pubs and a complete A to Z of outdoor activities." Beachspoke - Black Moon is a one-of-a-kind property that boasts floor to ceiling glass doors. With a sliding door separating the bedroom from the living room, you can swing the wall back and lie in bed taking in the beautiful view of St Ives Bay. Sleep two. From £200/night. Beachspoke - Black Moon, St Ives. Sitting right on the beach in the Scottish Highlands, Balnakeil Beach Bothy in Durness is the picture of solitude. With the village just a mile away, guests can enjoy the peace and quiet of their surroundings before strolling into the village to grab a bite to eat. Sleeps two. From £440/week. Perfect for a family getaway, this property sits in its own eight-acre valley alongside the beach. Hidden away it a private garden, Tresillian in Sennen has beautiful views of the shoreline and sea and there is plenty of room to accommodate the whole family. Sleeps eight. From £149/night. 3 Gull Rock in Woolacombe is a new apartment that overlooks the beautiful Coombesgate Beach. The large terrace is one of the property's highlights, giving the guests plenty of space to enjoy the view and relax in the Devon sunshine. Sleeps four. The Chapel House in Penycwm is a beautiful 18th century chapel has been restored with many of its original features still in tact. Visitors can take a quick stroll along the National Trust path to reach a number of the stunning beaches that can be found nearby. Sleeps eight. Found in one of Devon's surfing hotspots, Surf's Up in Croyde sits right on the beach. The house also has a large private garden for guests to enjoy as well as a deck and spacious open plan living areas. Sitting right on the shore at Whitsand Bay, Infinity is home to unobstructed views of the south Corn​ish coastline. With modern interiors and stylish finishing touches Infinity is well equipped for a luxury weekend away. Sleeps two. St Ives in West Cornwall is an ideal family holiday destination, where you can learn to surf with trained instructors on Porthmeor Beach, take a boat to Seal Island to spot Grey Atlantic Seals that often swim up to the boat to say hello, or embrace your artistic side at the St Ives School of Painting or Tate St Ives. Try the delicious food on offer throughout the town, whether it’s fresh seafood at the Rum & Crab Shack, or sampling the 'Big Kahuna' burger at Hub St Ives (the burger just won best burger in the country at the National Burger Awards). Stay at Seaglass (sleeps four) in St Ives with Aspects Holidays to make the most of the lively area and enjoy the incredible sea views. The Isle of Wight is the perfect destination for families seeking an escape from the hustle and bustle of mainland life. There are an abundance of ways to be entertained, from exploring the beautiful coastal paths that sprawl across miles of untouched beaches, to having fun-filled family days out at Owl and Monkey Haven. Osborne House, the cherished home of Queen Victoria, Prince Albert and their nine children, is a must-visit attraction, along with West Wight Alpacas, a trekking and alpaca stud farm set within 23-acres of picturesque countryside. Looking for a place to stay? Isle of Wight Treehouses is ideal for families seeking exciting accommodation in the island's woodland area. Getting to the Isle of Eight is easy with Wightlink Ferries. For the ultimate family adventure, head for North Wales to take pleasure in the beauty, exuberance and boundless potential of the great outdoors. With medieval castles, gardens, steam railways, museums, mountains and beaches, there is so much to do in this beautifully diverse part of the UK. Surf Snowdonia is the world's first Wavegarden surf lagoon, built inland in the lee of the Snowdonia mountains and playing host to a surf academy, restaurant and viewing hub and camping pods. At Zip World Caverns, you can experience the world's largest fully underground zip line course, with its exhilarating underground zip lines, rope bridges, obstacles and tunnels. Tree Top Adventure has a high-rope adventure course set in the stunning forest of the Conwy Valley, as well as the Powerfan Plummet, the worlds' highest powerfan tree parachute simulator. East Lincolnshire's tranquil charms take nothing away from its huge family appeal. Cleethorpes, near Grimsby, boasts three miles of unadulterated Blue Flag beaches, with plenty of space to fly a kite, play beach games or simply dig your toes into the soft honey-hued sand while eating fish and chips off your lap. Looking out onto an equally unspoilt stretch of Lincolnshire’s coastline at Anderby beach is the world’s first cloud-spotting bar. Drinks aren’t exactly on offer but 'Cloud Menus' help to identify different shapes and formations, while specially designed reclining seats give older generations an excuse to put their feet up. Keep young ones busy by spotting a rampaging elephant, a grinning crocodile, a monkey’s face... and if they start to get antsy, a turn on Europe’s longest looping rollercoaster at Fantasy Island Theme Park, near Skegness, is sure to put them in high spirits again. Donkey rides across miles of golden sand, fish and chips along the vast prom, theme park rides on a colossal new pier... when Weston-super-Mare does 'family seaside holiday' it does in to the nth degree. Down by the seafront, the Grand Pier has all the pleasures you might expect, from stomach-churning rides to penny slot machines and a twirly whirly double-sided helter skelter – though older generations might opt to relax in the Edwardian-style tearooms instead. Regroup over a family meal at Tutto Ristorante & Gelataria. The waterfront restaurant boasts tasty coffees, authentic Italian food and the best ice cream in town, with traditional seaside flavours like toffee apple and candyfloss. Suffolk has some of the best beaches in the UK, along with numerous harbours and inlets, perfect for sailing, fishing and watersports on a family holiday. Inland, families can find a huge variety of things do to, ranging from historic castles and ancient villages, to nature centres, theme parks and activities, such as glass blowing and high ropes. Some of the best places to visit are Southwold Pier, the Suffolk Owl Sanctuary and Framlingham Castle. Glamping at Lantern & Larks' glorious rural idyll at Sweffling Hall completes the picture. Located on the North Devon coast and home to one of the most beautiful beaches in the area, Croyde is a marvellous place to visit for a family holiday in the UK. A quaint village far removed from the usual resort towns of the area, the main draw is the stunning beach which is great for surfing or running wild on the sand. Meanwhile, Cascades swimming pool is located in the town and enables little ones to take advantage of the water rapids, waterfalls and 230ft blue slide. Other activities in the area include breathtaking coastal walks around Baggy Point, surfing at the UK’s favourite beach in nearby Woolacombe, and visits to top attractions such as The Big Sheep and The Milky Way. There is also an abundance of family-friendly places to eat in Croyde, including The Thatched Inn, Billy Budds and The Kings Arms in Georgeham. Croyde Bay Holiday Resort and Ruda Holiday Park are just two of the top places for families to stay. For parents who want an active holiday that will get the kids away from smart phones and tablets, Strathyre offers a number of exciting ways to explore the great outdoors. Mountain climbing, forest walks and bike rides, as well as fishing, canoeing, pony trekking and sightseeing will fill up your holiday itinerary. Take a trip to the town of Callander, the gateway to the Highlands, or the majestic peaks of Ben Ledi overlooking Queen Elizabeth Forest Park, where the brave and adventurous can take on the Go Ape high tree challenges. If you love nature, families can look out for red squirrels, wild deer, buzzards and other wildlife in the sanctuary of the forest. Forest Holidays' cabins have enchanting views of Loch Lubnaig and the grassy glade between the forest and loch. The luxury self-catered cabins are available with private hot tubs to relax in after a day exploring, and the friendly staff at the Forest Retreat can arrange bike hire, canoe trips, Go Ape adventures and even 'Hidden Glen Safaris'. The Lake District is a classic family holiday destination in the UK. For younger families, there is the fantastic World of Beatrix Potter where little ones can meet some of the best-loved characters from the books, take a walk through Peter Rabbit’s garden or stop off in Jemima Puddle-Duck’s woodland glade. Alternatively, you can try something completely different by visiting one of the most unusual yet popular attractions in the area, including the Keswick Pencil Museum, home to exhibits such as the world’s longest pencil and an array of classes and workshops. The South Lakes Safari Zoo, labelled as one of the best zoos in the country, houses hundreds of species from Sumatran Tigers through to the rare white rhino. Sykes Cottages offers beautiful rental properties for families in the Lake District. For a wonderful family city break filled with history, culture and fun, head for the World Heritage City of Bath and its surrounding countryside. Explore the world-famous Wookey Hole Caves and look for the Witch of Wookey, check out the cheetahs and feed the giraffes at Longleat Safari and Adventure Park, before enjoying a show at the egg, an award-winning theatre aimed at children, complete with a family-friendly café and play area on the ground floor. If you need somewhere to stay, look no further than Woolley Grange Hotel, a beautiful Jacobean manor house that does everything to make your life easier with the young ones (from bibs to bottles), offering activities for your energetic teenagers and providing childcare for parents to enjoy some alone time. A wealth of adventures and family fun is on offer in Nottinghamshire's Sherwood Forest, home to the legendary Robin Hood. It is at its best when the Robin Hood Festival takes place each August, featuring jousting, falconry, archery and medieval fun and games. Stay in Sherwood Forest in a luxury log cabin at Forest Holidays, with 3,300 acres of forest to explore from your cabin doorstep. Do as much or as little as you like with forest ranger walks, Go Ape, segway hire, cycling, walking, archery and hot tubs to relax in at the end of the day. Enjoy a family city break in Plymouth, where you can try a wealth of activities on land and water. Try boat fishing in Plymouth’s plentiful waters, with mackerel trips to deep sea excursions available. You can keep what you catch for supper or have it cooked for you at The Boathouse Café. Don't miss a visit to the National Marine Aquarium, the UK’s largest aquarium that houses over 70 sharks from more than ten different species. Cycling is an excellent way to explore Plymouth and travel beyond the main streets to discover some of the city’s best parks, outdoor spaces and historical areas. With expansive heathland, dense forest, stunning coastal towns and quaint country villages, there is so much diversity to the New Forest which makes it a great place to explore with the family. Young children will love Peppa Pig World at Paultons Park, where they can meet their TV friends. For thrill-seeking older kids, the New Forest has lots of adrenaline pumping water sports, such as kayaking, rib rides and parasailing. If you prefer to keep your feet dry but experience nature, a family hike or bike ride along some of the New Forest cycle routes and walking routes will allow you to take in the beautiful views. Is this the best island in the UK?